ADI’s undercover investigation exposed horrific treatment of monkeys at Biodia, a Mauritian monkey factory farm that supplies US laboratories, and revealed that many of these monkeys could soon be behind bars in new breeding farms in Florida. ADI’s findings came just days after the US Fish and Wildlife Service revealed that monkey imports are on the rise. ADI calls for the US to stop the import of monkeys for experiments or breeding and for the US to join the international move away from monkey experiments. 3000 monkeys each year are imported from Mauritius to American labs, and hundreds come from Biodia. 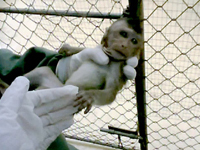 ADI’s investigation revealed that Biodia’s US trading partner Prelabs is one of several other primate breeding farms establishing strongholds in Hendry County, Florida. Permitting documents indicate upwards of 10,000 monkeys are or soon will be suffering this barbaric life. Hendry County is now an epicenter for US primate breeding, despite opposition. ADI reached out to state and national legislators, the Florida Fish and Wildlife Commission, Hendry County Commissioners, the city of LaBelle, and stakeholders in opposition to this cruel industry, whose horrors are evident in one ADI investigation of a Mauritius breeding farm. A Hendry County Circuit Court recently ruled against monkeys and Florida citizens in denying a plea for public notice and hearing under the state’s ‘Sunshine Law’ in permitting these facilities. The ruling relied upon local definitions (or lack thereof) to equate monkeys with livestock, though state law does not include macaques in clear, finite ‘livestock’ definitions. The state wildlife commission, which exerts preemptive powers over captive wildlife, clearly defines macaques as nonnative wildlife. For now, this cruel trade continues. Please urge officials to take measures against the cruel monkey breeding and trade in Florida. Use our template letter – take action for the monkeys here! Make a donation to help ensure we can keep exposing the suffering and campaigning for change.